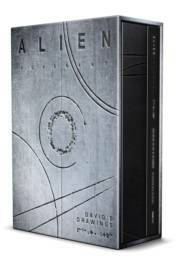 This exclusive collection, containing two books, gives readers an insight into the most intriguing character from the Alien prequels. The in-universe sketchbook contains over two hundred illustrations from the set and will take you inside the mind of David. Then read Developing the Art of an Android for an interview with Dane Hallett and Matt Hatton, the artists behind all of the beautifully grotesque sketches.